I spent last week adding the projects for the Summer 2015, Fall 2015, Winter 2016 and Spring 2016 to Ravelry. The person who had been doing this left the office and I didn't notice for awhile. After discussing who should be doing this, I just decided to get it done. I have to say it was a TON of work but I'm glad I did it. Now I will do it as soon as the magazine is published or maybe a few days before. This week we discussed the events for the conference since registration will go live next week. We will, of course, do the yarn tasting again this year but instead of the goody bags we will be doing several door prizes. It is very expensive shipping that yarn all over the country, both for us and for the sponsors and putting together those goody bags was a massive effort. Just a reminder, please let me know when you send a lesson and include a tracking number. By the way, I had a request to change the color of the video links. I am trying out red. I hadn't planned on discussing this topic but I reviewed a swatch from a student of my Finishing class where this occurred. Since Level 2 of the Masters Program requires buttonholes in seed stitch, I thought I'd discuss this. When you work a buttonhole in any type of stitch pattern, it is important that the stitch pattern not be interrupted after the buttonhole is made. 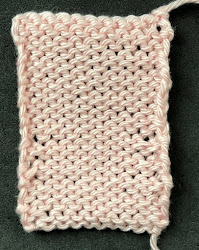 Seed stitch can be used as an example of stitch patterns. I've seen many knitters who go into a the default mode of always working a K2tog after a yarnover but this may not work for all stitch patterns. In the photograph, notice that the stitch pattern is continued. after the buttonhole. In the photograph below, this is not the case. Salon will be from 3:30-5:30.